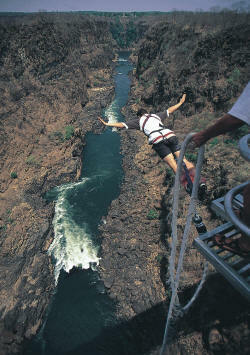 he highest commercial bridge jump in the world in the most spectacular setting! This must be the ultimate adrenaline rush, as you leap into space, free as a bird, saved from the swirling water below by the rebound of the cord, then hurtled upwards again at great speed. It’s an indescribable feeling that will probably change your life ! Against all better judgement you throw your self head first into …….nothing….you fall and fall and fall and if you can put aside the terror of being completely at the mercy of a piece of cord, it’s an utterly blissful feeling …… Highly recommended for the slightly mad. No booking is necessary, just take a stroll down to the bridge. You’ll have to go through the border post as the bridge is in no-mans-land, between Zambia and Zimababwe, 111 metres high, spanning the magnificent Batoka Gorge. Just tell the guards you’re going to bungee jump and they’ll let you through without the normal exit procedure.